The very existence of the dishwasher is a feat of engineering and technology. The device has become a staple in just about every kitchen in the U.S. and is gaining popularity in other parts of the world. However, there are definitely some parts of the aged design that can stand to be improved on. These concepts and real-life dishwashers all start from the same point – a machine that washes dishes for you – and go in some unexpected and interesting directions. Urban dwellers with very limited space will appreciate the fact that the Briva In-Sink Dishwasher is an actual real-world product – and that it uses up to 50% less water than a traditional dishwasher. 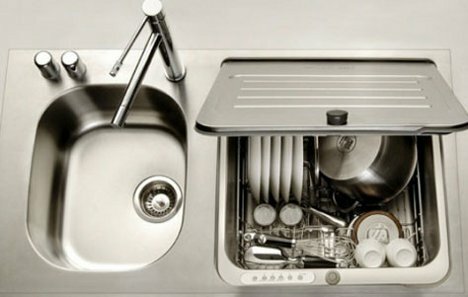 The flexible in-sink unit washes small loads of dishes quickly, making life easier, even for rushed city folks. 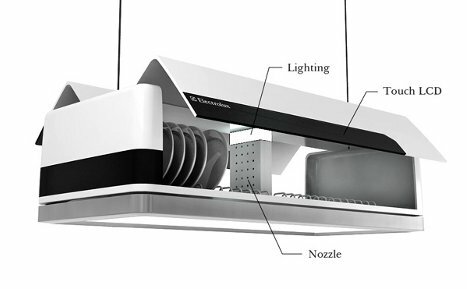 Easily the oddest design on this list, the Dishwasher L is an unusual cross between a dishwasher and a dining room light fixture. 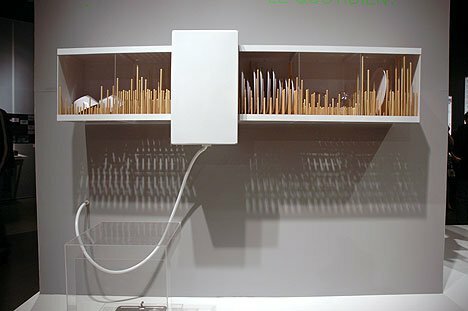 According to designer Kim Joonmin, the strange device is meant to keep dishes and silverware close at hand in the location where most families eat their meals. Water from the wash cycle is purified and recycled to be used again and again, eliminating the need for water and waste lines to and from the fixture. Who says dishwashers have to sit in or next to the sink? 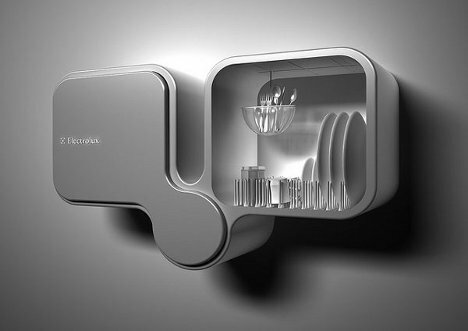 This wall-mounted concept from Electrolux would free up plenty of floor (cabinet) space but still keep your dishes close at hand. 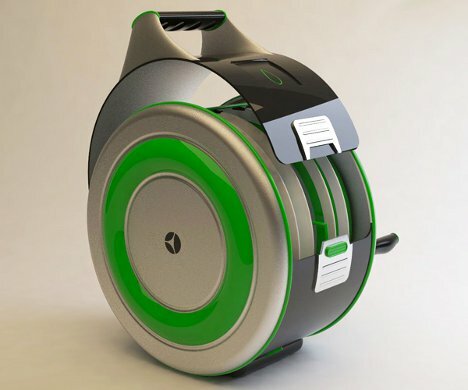 The device would use less water and energy than current models, making it a smart environmental choice. On a similar design wavelength is the Mural Dishwasher from student designers Marie-Christine Lacasse and Marie Claude Savard. Dirty dishes go into the cabinet (your mother would be appalled!) and a movable robot dishwasher moves along the line, washing each dish where it sits. 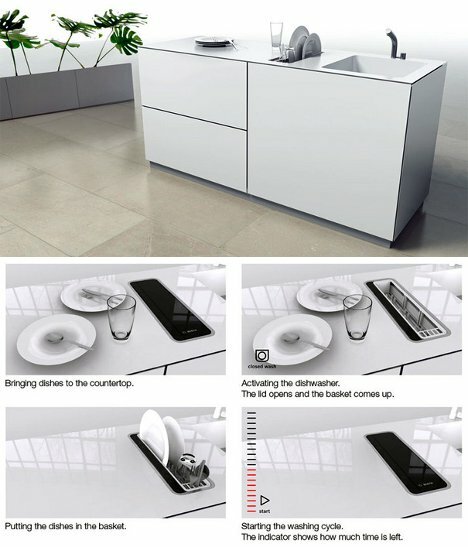 This eco-friendly dishwasher concept from Vincent Liew puts the dish washing duties on the countertop, making it physically easier to load up the dirty dishes. This is particularly good news for older people who live alone. 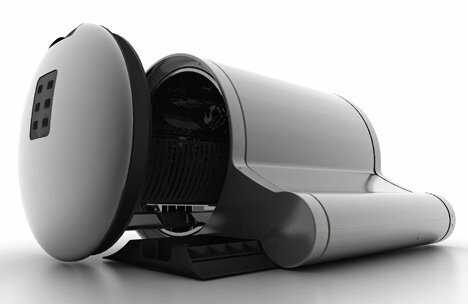 The concept is just the right size for a one or two person household, and it requires no detergents, instead using steam to clean and disinfect its contents. In this revolutionary revolving concept, the dishwasher requires hardly any additional space because it occupies the area that a sink would normally inhabit. 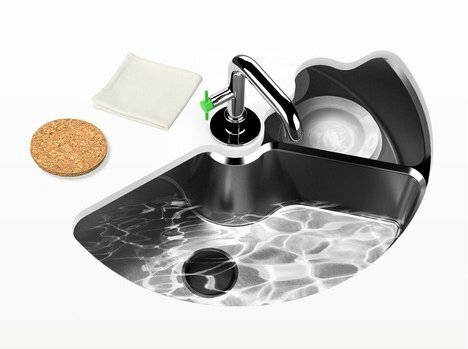 The difference: there are two rotating basins to this sink. The one in front acts as a regular sink, rinsing and holding dirty dishes. When it gets full it rotates to the back, where hidden machinery turns the basin into a simple dishwasher. 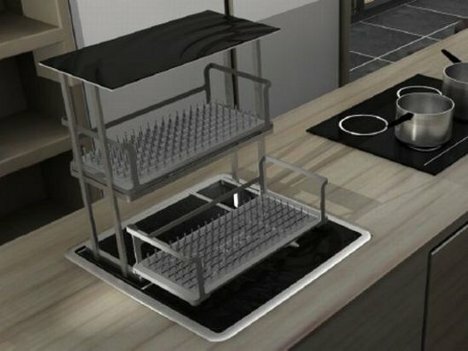 The idea is intriguing, but it seems that it would be a bit more effective if the dishes were separated in a rack of some sort. Product designers know by now that they can’t go wrong with integrating two existing products that everyone uses every day. 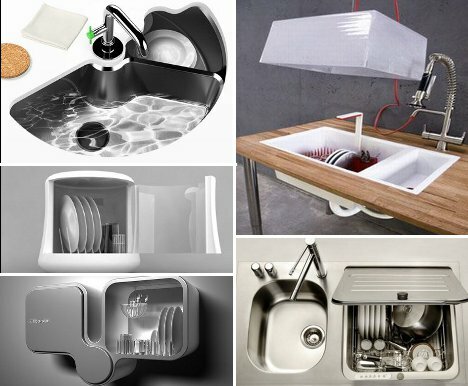 The combined kitchen sink and dishwasher design above is a brilliant example of an intelligently blended object. To wash the sink of dirty dishes, one only has to lower the dishwashing hood. For households with one or two people, a big dishwasher can take several days to fill up. 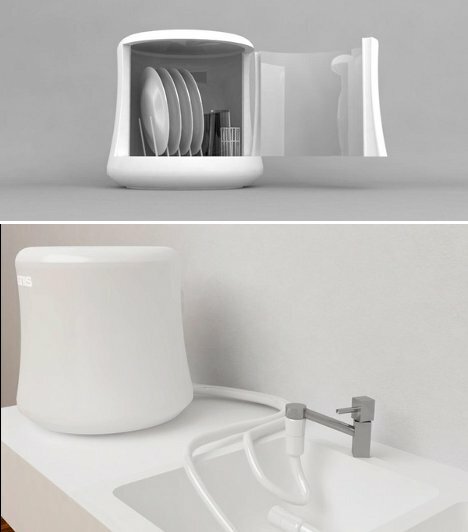 The Instant Dishwasher concept by designer Robert Lange takes up hardly any space and efficiently washes just a few dishes at a time. The space-age design fits under the kitchen countertop and slides open only when needed, revealing a small basket just big enough to accommodate the dishes from one meal. The Gota is another small-family design that has limited room for only a few odds and ends. It obviously won’t do for when you’ve got the entire neighborhood over for a holiday meal, but it would be ideal for sticking your breakfast dishes into as you and your partner dash out the door to work in the morning. Also intended for very small loads of dishes, the Mono dishwasher sits on the countertop and extends water and drainage hoses into the kitchen sink. Looking somewhat like a giant plastic marshmallow, the Mono washes just a few items at once and can be moved into a closet or cupboard when not in use. Washing dishes when you are camping, hiking or otherwise away from civilization is usually a tricky proposition, but the EcoWash from designer David Stockton makes it delightfully simple. 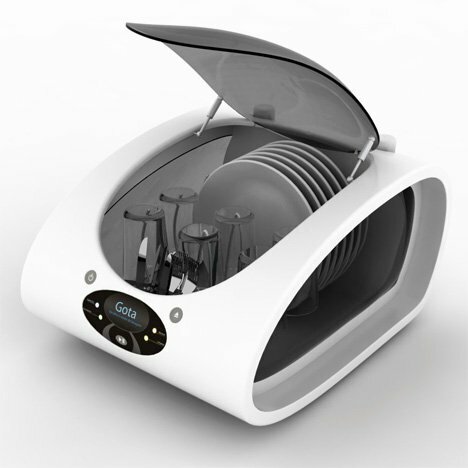 A self-contained unit that holds just a few dishes and can be carried around by a handle on top, the EcoWash operates with the power of the user’s arm rather than electricity. An inlet on the top lets water in from a hose or faucet, and a small drain on the bottom lets dirty water out after the dishes are clean. Using ultrasonic sound waves rather than detergent, the ultrasonic dishwasher from French appliance maker De Dietrich is a departure from the usual soap-and-water route. 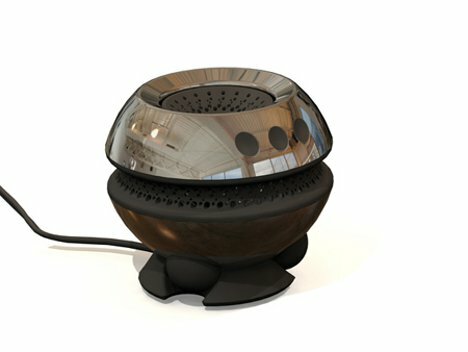 The futuristic appliance is reminiscent of the ultrasonic cleaners used in jewelry stores, but on a much larger scale. Another take on the ultrasonic cleaning method is the Bubble Dishwasher, a small device that turns an ordinary sink full of water and dirty dishes into a high-tech dish washing machine. 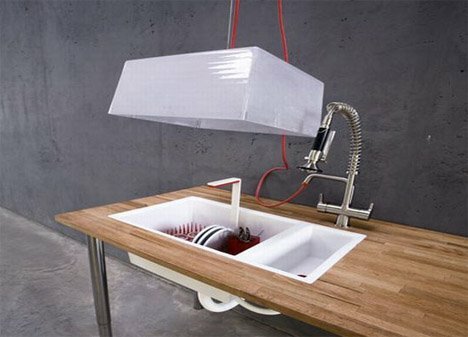 It features a rechargeable Li-Ion battery and sits in a sink full of water, releasing ultrasonic sound waves to scrub the dirt away from your dinner dishes.